The artist's studio is a sacred space. This is ritual space/time where, as Robert Bly says, transformation can occur. 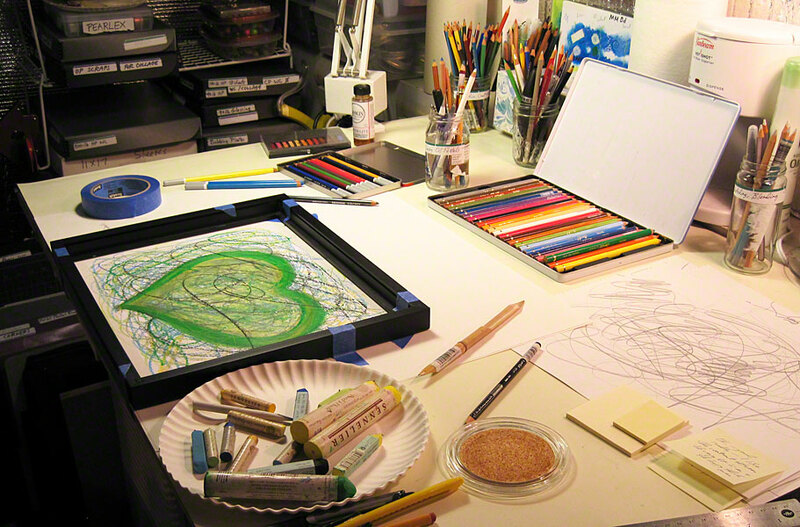 This little studio that I call "the Nest" is where I make heart paintings. It's an insulated room, 8 by 10 feet with a high ceiling (thank heavens), that began as the office for my blacksmithing studio, then became the studio "clean room" for varnishing iron. (I used solvent-based varnishes at first, which attracted dust for at least six hours while they dried.) The first heart paintings -- acrylic on canvas -- were painted here. The drawing board is at least 32 years old -- brought from our former home in the city. As soon as I enter this little studio, I smell the waxy fragrance of the oil pastels, and begin to relax into a sense of sacred space-time. Just as decades of prayer seem to infuse something special into the atmosphere of a church or temple, my decades of making art in this comforting "Nest" carry me into a special state of being. Sometimes I begin with meditation or ritual, but often it's not needed. I set down my cup of coffee and push the button to start my playlist of songs about love and heart, and am ready to begin. In case this sounds just too, too high-falutin' spiritual, the first song on my painting playlist is "I Feel Lucky," by Mary Chapin Carpenter. So I'm setting down that coffee cup not only to paint, but so I don't spill it as I start to dance around! Where is your special, sacred space-time? What music gets you into your best work flow?